Vol 4 | Issue 3 | Sept-Dec 2018 | page: 14-16 | Nandkishor B. Goyal, Sayyadshadab S. Jafri, Ashish Vinayak Patil, Aashish Babanrao Ghodke. Author: Ajiboye Lo , Oboirien M , Galadima AB . Department of Orthopaedic Surgeon, Usmanu Danfodiyo University Teaching Hospital, Sokoto, Nigeria. UsmanuDanfodiyo University Teaching Hospital, Sokoto, Nigeria. Introduction: An atypical presentation of meningococcal meningitis in a 10-year-old boy with rashless and bilateral symmetrical lower limb gangrene reported to stress the unusual pattern of the presentation. Unusual presentation of meningococcal meningitis is scarce in the literature, and we are not aware any unusual presentation in our setting. Case Report: A 10-year-old boy presented with bilateral lower limb gangrene following a week history of high-grade fever, chills, rigors, neck pain and stiffness, convulsions, headache, altered sensorium, anorexia, and vomiting with no associated history of skin rash. Examination revealed an acutely ill-looking boy that was febrile, pale, anicteric, cyanosed, and not dehydrated. The pulse rate was 120/min, blood pressure 90/50 mmHg, a respiratory rate of 26 cycles/min, and symmetrical bilateral lower limb dry gangrene up to midlegs with multiple patchy areas of skin necrosis/dermatitis (with eschars) up to mid-thigh noted with Glasgow coma scale of 12 (E3V4M5) and positive signs of meningeal irritations. The complete blood counts, erthyrocyte sedimentation rate, random blood sugar, and creatinine were deranged while cerebrospinal fluid from lumbar puncture showed features of bacterial meningitis. The diagnosis of meningococcal meningitis with bilateral dry gangrene of both feet and leg was made and was managed with fluid and blood resuscitation, intravenous antibiotics, bilateral above knee amputation, and other supportive care. The treatment and recovery were satisfactory. Conclusion: Meningococcal meningitis may present in an atypical manner which may pose a diagnostic dilemma and delayed appropriate treatment. Keywords: Rashless, Symmetrical lower limb gangrene, Meningococcal meningitis. 1. Rouphael NG, Stephens DS. Neisseria meningitidis: Biology, Microbiology, and Epidemiology, in Neisseria meningitidis. New York: Springer; 2012. p. 1-20. 2. Sáez-Llorens X, McCracken GH Jr. Bacterial meningitis in children. Lancet 2003;361:2139-48. 3. Marc LaForce F, Ravenscroft N, Djingarey M, Viviani S. Epidemic meningitis due to group A Neisseria meningitidis in the african meningitis belt: A persistent problem with an imminent solution. Vaccine 2009;27 Suppl 2:B13-9. 5. Davis MD. Peripheral symmetrical gangrene. In: Mayo Clinic Proceedings. Toronto: Elsevier; 2004. 6. Hussain M, Sharma SR, Rupsi M. Peripheral symmetrical gangrene in meningitis. Ann Indian Acad Neurol 2014;17:140-1. 7. Singh J, Himanshu D, Nim RK, Dinkar A, Gupta KK. Meningitis with digital gangrene in meningococcal infection: An atypical presentation. J Clin Diagn Res 2016;10:OD03-4. How to Cite this article: Ajiboye Lo, Oboirien M, Galadima AB. Rashless and Bilateral Symmetrical Lower Limb Gangrene in a Patient with Meningococcal Meningitis. 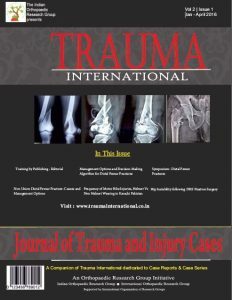 Trauma International Sep – Dec 2018;4(3):14-16.